The Waipa Kalo Festival is a wonderful and informative Kauai event you must attend while here on the Garden Isle. A rich weekend of activities, recipe sharing, and informative educational displays. It is high on the Turtle Cove Realty’s list of the best things to do in Kauai. If you wish to broaden your knowledge of the Hawaiian culture and the taro (Colocasia esculenta) (Kalo in Hawaiian) plant that has for generations fortified the Polynesian soul spiritually and nutritionally. 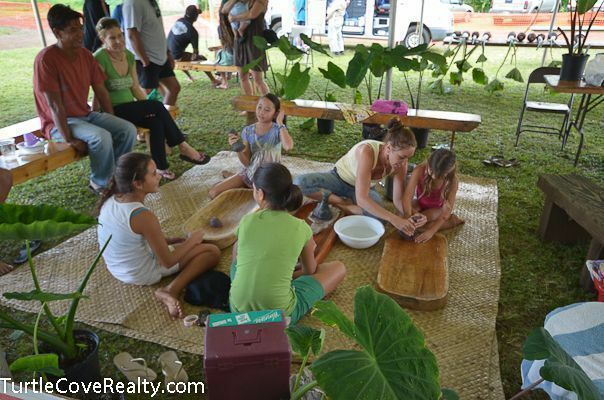 This festival set in the ahupua’a (land division) of Waipa, just minutes from scenic Hanalei Town on the north shore of Kauai, welcomes everyone to learn about kalo, taro. This potato like vegetable was not only an important food staple, but Hawaiians believe they are descendants of the taro, a gift from the god Haloa. Considered a ‘canoe plant’ by ethnobotanists, it was brought to the islands generations ago by the first discoverers from the South Pacific. This starchy corm is a powerhouse of nutrition that can be prepared in many ways, however, few methods are as readily recognizable as Hawaiian poi. Hawaiians are the only Pacific island culture, or the world, for that matter, that turns this tropical tuber into a pudding like paste that is both loved and misunderstood. To Hawaiians, the preparation of poi is equally as important as the nourishment it provides. The methodical working of the cooked starch on the papa ‘ku’i’ai or wooden board with the ku’i’ai or stone pounder is a time of special importance, talking and sharing events of the day, uniting through food as an ancient cultural bond. To the visitor who may have an opportunity to sample this delicacy at a luau, the taste and texture is somewhat disconcerting. Poi has the consistency of a pudding, but the taste is quite removed from a sweet creamy dessert. This confusion is warranted. The taste can range from earthy and slightly salty to sour with tangy overtones that originate from the process of fermentation. To the poi gourmand, the fermentation brings on that sour coveted taste that Hawaiians relish. This sour and tangy taste is achieved by aging and emerges when the poi is at least one week old and the sugars converted by microbial action enhance the flavor and consistency. This festival is the creation of the Waipa Foundation. A focus of the foundation is to educate and renew the Hawaiian connection to the aina, land by reviving and strengthening the culture through the very resources that in earlier times sustained a well organized society. When you visit Kauai, Hawaii make a point in your day to visit this area. See how the term sustainable is used in Hawaiian agriculture. Learn how the land, when respected and used responsibly, can nourish on many levels. It is a cultural treasure that you can take back home with you and it is an annual event. It’s easily one of the best things to do on Kauai. Lee Morey RB is the principal broker and owner of Coldwell Banker Turtle Cove Realty, she writes extensively about real estate Kauai and fun things to do on the island. Follow her on Twitter and let us know what you like best about Kauai.